I fell in love with Pete Sampras in 1990. There was just something about the way he carried himself that appealed to me, and I loved his on court no-nonsense attitude. His single-minded focus when he stepped to the line to serve was amazing. Yet it was more than his game, my spirit simply took to him as a person. I was his number one fan and I followed every up and down in his career. I even have a scrap-book on Sampras with pictures and newspaper clippings chronicling his career until the 2002 US Open. I collected everything I could that dealt with Sampras. I celebrated every victory with him and mourned every loss he suffered. When he struggled on court, I was screaming the loudest to encourage him to keep fighting. I love tennis as a sport in general, but I will readily admit that I often went to tournaments simply to see Sampras play. I knew he was finished after the 2002 US Open–I saw the toll it took on him to win that title. He was still capable of winning after that, but tennis was no longer his main priority. 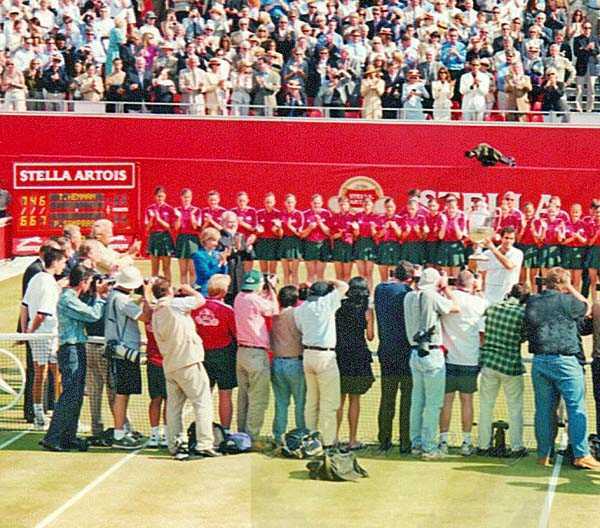 Although he delayed announcing his retirement until the following year, I knew he was never coming back when he walked off the court after the 2002 US Open Championship trophy ceremony. I saw Sampras play in person for the first time in 1993 from box seats in the Louis Armstrong Stadium. I was lucky to get there early enough to see him warm up. I was so excited; I could barely hold my camera much less focus the lens. 1995 was a very emotional year for Sampras (and me). In the Australian Open, he was overcome by emotion, thinking of his sick friend and coach Tim Gullikson. Distracted, Sampras lost the first two sets to  Jim Courier (USA) and I could see him losing it. He struggled to compose himself and willed himself to defeat Courier, 6-7(4), 6-7(3), 6-3, 6-4. 6-3. I was very proud of him. I was also at the US Open that year when he defeated  Andre Agassi (USA), 6-4, 6-3, 4-6, 7-5. One on my most prized possessions is my photo of him holding the 1995 US Open trophy, autographed by him. In 1996, I suffered along with  Sampras when he played  Alex Corretja (ESP) in the quarterfinals of the US Open. I was very worried when he got sick on court. I wanted him to quit, but he was determined to win that match and he did, 7-6(5), 5-7, 5-7, 6-4, 7-6(7). He was really suffering that day. I replayed that match on my VCR many, many times, because I was amazed that he had won in spite of such physical discomfort. I know that there has always been doubts about his physical fitness; however, Sampras showed everyone what he was capable of that day. In 1999 I saw him in the final at the Stella Artois Tournament in London. He defeated  Tim Henman (GBR) 6-7(1), 6-4, 7-6(4). When he won I jumped out of my seat and screamed so loud that an elderly British woman approached me and said, “good for you, cheering for your man”. I am sure I shocked the British folks that day, but I did not care because Sampras knew that not everyone was cheering for Henman. I am so jealous. I share the love for Pete as well. However, I was never fortunate enough to see him play in person. Great article.